Last Friday I used an interesting post by Pete Vordenberg as a starting point for looking at how we could expand on the idea of (roughly) measuring athlete development using FIS points. Since the USST announced their nominations last week as well, I thought it might be interesting to see how applying a tool like this might work in the real world. This isn’t a critique of the USST selections. This is simply meant as a demonstration of how informative (or not informative!) some simple data analysis could be in the context of team selection. I will be pointing out plenty of ways in which the data is ambiguous or unhelpful, trust me. FIS points as a measure of skier ability have plenty of well known weaknesses, but they can be informative, particularly if we’re aware of their weaknesses, so that we’re less likely to be fooled. Keep that in mind as we do this. Recall from last Friday that I presented some curves that represented a rough estimate of the ‘typical’ (as opposed to the best) FIS points at a given age earned by skiers who went on to place in the top ten (WC, OWG or WSC). I’ve had a few people comment privately that maybe that’s a little too loose a criteria; there may be lots of skiers with a single top-ten result who we aren’t really interested in comparing ourselves to. That’s a fair point, so let’s restrict things down to people who’ve finished in the top three in a WC, OWG or WSC race. That feels reasonable to me, since medals are such a constant stated goal of the USST. I’m using medians here, not the average of someone’s best five races, which is how we typically think about FIS points. Since this mixes together FIS points earned from WC levels races down to regular FIS races, the amount of ‘adjustments’ I can apply to the FIS points themselves is limited. The black line represents the median FIS point race for a skier at a given age who went on to reach the podium at least once. The black vertical bars represent the 1st-3rd quartiles, so the middle 50% of the data. 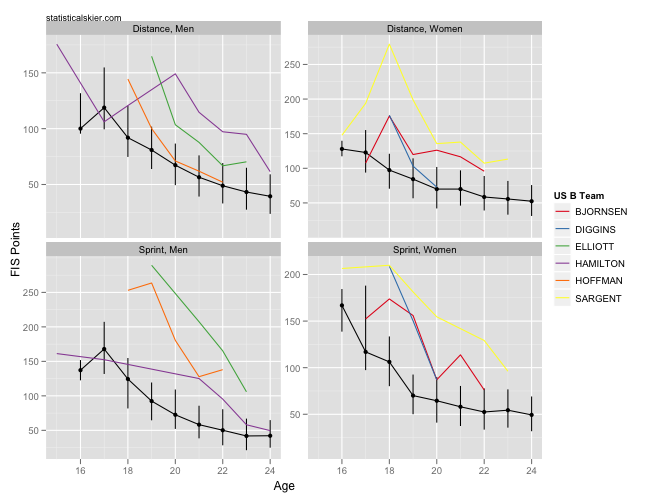 The colored lines represent the median FIS points for each athlete at that age. 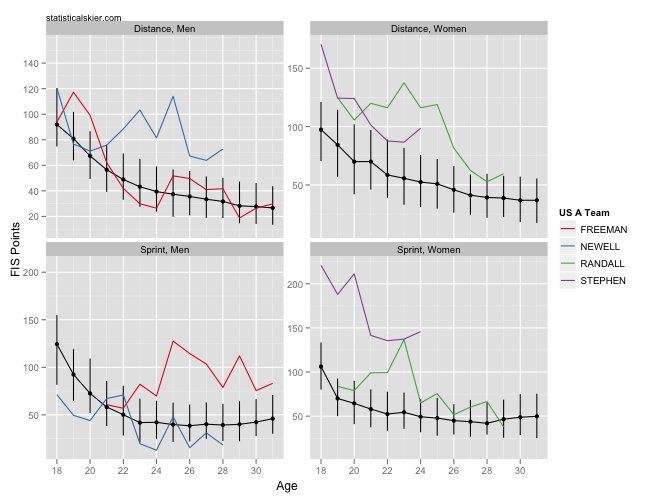 Keep in mind that the ages are approximate, and that I’ve adjusted them, since otherwise an athlete’s races at age 25 would include Jan-Apr of one season and Nov-Dec of the next, which isn’t quite what we want. 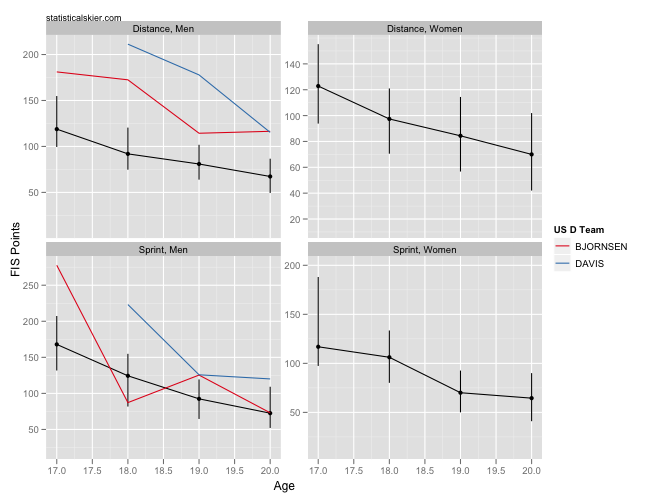 The colored lines give no indication of the number of races an athlete did at a particular age; at the younger ages this is often quite a low number. Kris Freeman and Andrew Newell fit the development curves fairly well in their respective specialties. Kikkan Randall wasn’t as strong in qualifying (which is all that sprint FIS points refer to) at some point in her early twenties. It’s tempting to look at this and conclude that Randall’s sprinting ability is being undervalued here, and I think there’s something to that. But then again, the points only measure qualification speed, and the benefit to qualifying 1st rather than 20th is debatable. Some interesting stuff is going on in the women’s distance panel, though. Randall’s general improvement is of course evident. Notice, though, that using this development curve as a guide, Randall appears well out of the mix until recently. Also, notice that both Randall and Stephen’s medians in their most recent season both sloped up somewhat. That doesn’t seem right at all. This is mostly the Marit Bjørgen Effect. Randall and Stephen both had fairly strong seasons on the WC circuit for them, but on occasion their FIS points were quite low thanks to Bjørgen (or Johaug or Kowalczyk) ditching the field by a minute or more. If you spotted each of them a generous adjustment and supposed that their median results dropped by the amount it actually rose you’d see Randall inching a bit closer to the median development curve, but Stephen would still be well above it (though improving). Things look good for Noah Hoffman here, and Jessie Diggins as well, although she’s still quite young. I’m generally less sure what meaning to draw from trends in sprint FIS points, but by this measure Simi Hamilton isn’t far off where you’d like him to be either. One thing this view of the data doesn’t account for is technique specialization. Tad Elliott, for example, is generally better in freestyle races, so looking at all of his races may hide a promising trend in a single technique. These guys are still young, but they aren’t far off in sprinting. Posted by Joran on Friday, April 29, 2011, at 6:00 am. Filed under Cross Country, Domestic Racing. Follow any responses to this post with its comments RSS feed. You can post a comment or trackback from your blog.